Maybe this is a familiar scenario. You’ve launched your content marketing strategy but it’s not working – few fans, even fewer followers, some light traffic to your blog, and a few lonely clicks from various calls-to-action. When you listen for the response, you hear nothing but crickets. Why? Perhaps you forgot to leave your bullhorn at the door. In an age when social media has given audiences so much say about your brand, what does human really mean? Let’s assume folks know what you do. But do they know who you are? We typically size someone up in the first 30 seconds. We ask ourselves, “Can I trust this person?” “Do I relate?” We look for visual and audio cues – clothes, body language, manner of speaking, and more – with the goal of connecting. The same goes for your content marketing goals. What impression do you make when a person first meets your brand through screens, a retail store, or a magazine? Like a face-to-face encounter, each of your channels is a potential handshake moment. Except you don’t have 30 seconds to make a first impression. You have maybe three seconds. How do you want to come across? In today’s world, we talk about products before we buy. Are your clients and customers gossiping about you in the best sense? If not, why not? Liberty Mutual’s Responsibility Project is a gorgeous eye-level example of how a dry insurance company brought its values to life and gave countless readers a chance to find themselves in stories that are changing the world. Change must start deep. Brands must tell an authentic story based on corporate DNA. Fake friendly (overseas customer-service reps with dreadful scripts take note) won’t pass. Trying to be eye-level with your customers – but doing so without a sense of your company’s true identity – will ultimately read as cynical and false to a customer base willing to tune out in a heartbeat. Hiding old brand-centric behaviors will flop. Let’s ditch the metrics for a minute. Consider an easy three-step process to get on the “speak-human” bandwagon in a way that resonates with audiences. Today, the goal is not bullying, but inviting. Not grabbing attention, but earning and holding attention. Naturally, you want audiences to take action. But it’s the rare brand that understands how content and story must interact to add real value versus merely sell a product or service. Be storied. Storytelling is an essential human activity and must be the cornerstone of any meaningful content strategy. If story is the nest, content becomes the baby starlings that grow strong and fly off carrying compelling messages. Story instantly communicates your history, values, beliefs, and more. Unless you have a real story, loyalty is out the window. Chipotle’s remarkable Scarecrow video may not be the happiest tale but as pure, storied content marketing it effectively conveys brand values regarding nutrition, animal rights, and corporate ethics. To date, the video has received more than 13.5 million YouTube hits while its game app is a huge success. Be humble. In a word, kill the id and step back. Don’t sell products. Sell information, education, and inspiration. Don’t sell me a camera. Teach me how to take a great picture. You say your brand is great? No one’s listening. Goldman Sachs got out of the way in its Progress video campaign. As opposed to offering a dry talking-heads discourse on investment banking, it profiled the companies in which it has invested, and the positive changes those companies made in the world. Be relevant. Mass marketing is last century. 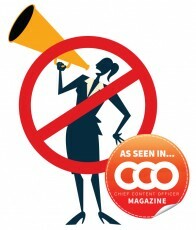 Cast too wide a net, and the meaning of your content marketing is lost. If you publish a newsletter for neurosurgeons, don’t blog about breakthroughs in orthopedics just because it’s also in the medical field. Be clear. Develop content at eye level and in plain English. Less jargon, more heart. No marketing speak. Be helpful. Keep the focus on clients to captivate and be memorable. Help audiences think about how you add value to their lives. Be concise. Lean the copy. Then lean again. No frivolous words. Make each idea count. Be consistent. One voice. One tone. Across all channels. When creating a content marketing strategy, remember what it felt like when someone last held the door for you. We’re all loyal to countless brands. And there’s a reason why. Above all, consider how you can be genuinely useful to clients and make their days and lives better. The most well-intentioned strategy is only as good as your last tweet. Remember President Kennedy’s famous quote? Let’s spin that: Ask not what your clients can do for you, but what you can do for your clients. This article originally appeared in the October 2014 issue of Chief Content Officer. Sign up to receive your free subscription to our bi-monthly magazine. A content strategist and publisher, Kevin Lund is a principal with T3 Custom. A story architect and content writer, Eileen Sutton is the principal of Sutton Creative. Together, Kevin and Eileen help leading financial firms develop smart, user-friendly content so their customers think more kindly about gigantic financial brands.